Your outgoing mail will look uniform and refined when you give it a stylish look with these return address labels from CheckAdvantage. The elegance of fine silver and the professional appearance of polished marble combine to create the perfect way to top off every letter or package. However, the most important benefit of this product is how it simplifies the time-consuming task of filling out envelopes. Forget about the hassle of writing your name and address every time. Just peel and place thanks to a convenient, self-adhesive backing. 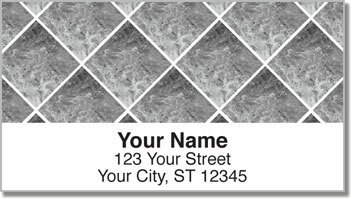 Order your very own Silver Marble Tile Address Labels today! Get them with a set of matching personal checks. We also offer several other marble color options.